Mark 8:34 Then he called the crowd to him along with his disciples and said:“If anyone would come after me, he must deny himself and take up his cross and follow me. This cartoon* from a Rick Morgan article depicts this point well. Questions for Personal Reflection: Are we similar to what Thomas a Kempis and Rick Morgan have illustrated? 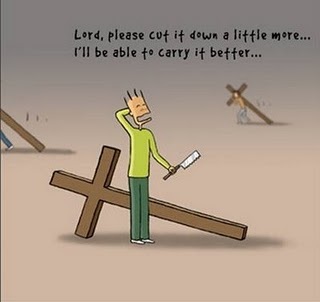 Do we long for Christ as long as it’s easy to follow His path? Easy Christianity just doesn’t work, though. 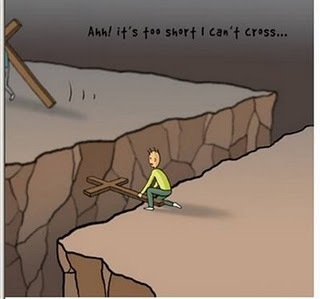 Like the cartoon shows, if our cross is too short, we can’t get over the tough times in life. We will miss out on the celebration in heaven! Let us be willing to take up His cross, and through Christ we will see the victory. This entry was posted in Devotionals & Articles and tagged Bible, Christian, Christians, Church, cross, devotional, devotionals, discipleship, God, Ipoh, Malaysia, Mark, religion, Scripture.